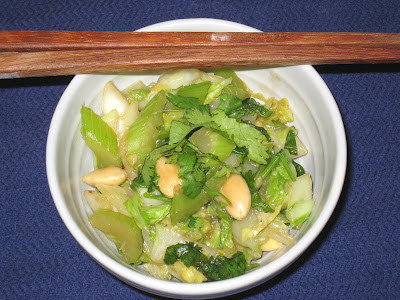 What to do with that last quarter of Chinese cabbage and celery? Toast up some almonds and whip up a satisfying stir-fry side. It is awfully green, I will admit, which would have bothered me more if it were meant to be the main attraction, but as a side I think it works. That being said, the next time I make it I hope that I have maybe some red bell pepper or a fresno chili around to add a splash of color. Both the cabbage and the celery cook quickly so this comes together in just a few minutes. If the almonds aren't already toasted, you can do that while you are getting everything else ready and they have time to cool while you're cooking the cabbage and celery. Then you just throw them in at the end. I didn't have any garlic ginger paste, or even any ginger for that matter, so I did not add either garlic or ginger. The cabbage and the celery are both so mild that I was afraid they would be overpowered by the aromatics, and I do think it made for a better dish without them. It certainly made for a faster dish. I used what has become my regular stir-fry sauce. By now, it takes almost no thought for me to pull down the wok and put together a tasty little side. Combine the first 5 ingredients in a small bowl. In a smaller bowl, combine the cornstarch with a tablespoon of water and stir to combine. cornstarch and water and stir just until thickened. Turn off the heat, stir in a little bit of toasted sesame oil and then remove the vegetables from the hot wok and serve immediately, garnished with cilantro. This recipe is simple yet delicious and healthy. This is perfect for me because I really love eating healthy foods especially Asian foods. I will definitely try this. I just read your blog its too interesting thank you for sharing, Here you will find some easy and healthyChinese recipes for all those who are health conscious - minus the sugar!